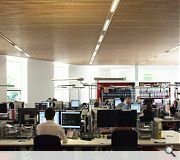 Situated behind an unassuming shop front in Edinburgh's Grassmarket, Buro Happold (with LDN architects and Quantity Surveyor Morham and Brotchie) have carved out a TARDIS like open plan office space to accomodate the engineering consultancy's growing staff roll. Sustainability has been key to the rehabilitation of the former printworks, both in the re-use of existing buildings within a city centre location close to public transport and amenities and in employing a range of energy efficiency, ventilation, light and waste management features. 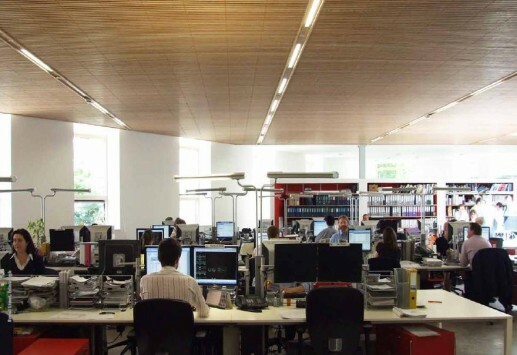 Amongst a raft of challenges overcome by Buro's designers was to gain building regulation approval for an untreated timber ceiling. Ordinarily these would be treated to prevent the surface spread of flame but the chmeicals used are not sustainable. 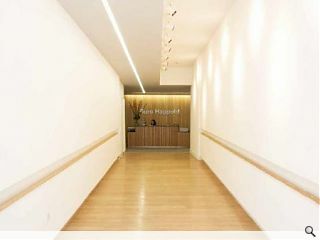 Happold's fire engineers, FEDRA, were able to circumvent this however by showing that escape periods were short enough to permit a full building evacuation.